Last year several of our pastors attended a workshop on multi-venue churches. One of our big takeaways was that every venue should have it’s own value-add: that one thing that sets it apart and makes it attractive for potential attendees. For some venues, that may mean a unique music style. For others, cafe tables instead of chairs in straight rows. For others, $100 bills falling from the ceiling (it’s suggested that you reserve this for only the truly desperate venues). In just a few weeks we’re excited to launch Brier Creek South, a new 450 seat venue that will offer two new worship experiences and free up critical space in our North auditorium. The BC South leadership team has struggled with our “value add” for the new venue. True, it has a larger lobby, but that’s not really a knock-it-out-of-the park deal. Multiple individual bathrooms with one potty each? That’s more of an inherited building design rather than a pre-planned feature. And with the construction cost, those $100 bills won’t be falling from the ceiling anytime soon (have you seen the cost of sheetrock these days?). That’s why I’m excited to announce a value-add that will only be available at BC South: our new Go Joe phone app. Go Joe was designed with the time-concious church attender in mind. In our North lobby, there’s always a long line waiting for coffee. With Go Joe, you’ll be able to use your iPhone, Blackberry, or Android to order your customized coffee, then pick it up at an express window just before you enter the auditorium. The concept is simple: order via your phone app…your order is synced with our brand new coffee bar iPad (man, am I excited about this), and you pick up your piping hot brew at a time that’s convenient for you! I’m grateful to our tech team, who has been hard at work in conjunction with our First Impressions team to make this happen. Phase two of Go Joe will be the launch of an in-service order feature: order during the closing worship set, and we’ll have your order packaged for the trip home! Remember, though: Go Joe is only available for those who attend Brier Creek South. 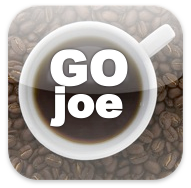 To download the Go Joe app for your phone, click here. I love it and I am not even a coffee drinker!!!! I am still not a coffee drinker!! Is it really April 1st ALREADY? This was almost as good as last year’s baptism Xpress! Hard to top that one…. I have been looking forward to your post today ALL week!! Thank you for not disappointing! I think you undersell the lobby-potty situation.